Subject: a broad description of the area of study such as History, Language Arts, Math, Science, etc. Course: a subdivision of a Subject specifying a particular area of study within the Subject. Subjects are required and can be designated as either Core or Elective. If you have Subjects that are required to be taught in your homeschool, you might choose to mark them as 'Core'. Your HSTOnline database starts with four Core Subjects: History, Language Arts, Math and Science. 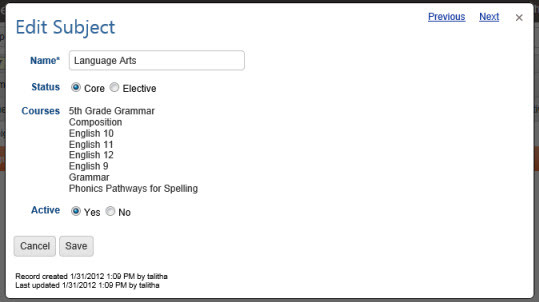 You can use these Subjects as they are, you can edit any one or more of them to change the name or Core/Elective status, and/or you can add additional subjects such as: Foreign Language, Technology, Art, Music, etc. In general, you won't have more than 10 or 12 Subjects total for all of your Students. One subject can be used for more than one student and more than one grade level. Use the Course feature to further specify the area of study. On the Subjects List page, the display can show the Subject name, Core/Elective Status, number of Courses tied to the Subject, and whether the Subject is Active or Archived. When you edit a particular subject you can see the names of all the Courses tied to that Subject. if you want to use Weighted Grading. if you want to use multiple Grading Scales within your homeschool. in the high school years if you want to be able to create a Transcript with Credit Hours. When using Courses, you can assign Credit Units; enter a course description; assign Weighted Grading; and select a Grading Scale for each Course you create. If your Students are in grade school or middle school, you don't need Courses unless you are required to use Weighted Grading. When your children reach high school levels, you will want to set up Courses to take advantage of the credit hours and Transcript features. The Course feature can be disabled in the Optional Fields section of Program Options. On the Courses List page, the display can show the Course name, the Subject it's tied to, Credit Units, Credit Calculation option, Grading Scale, Notes, Weighting status and whether the Course is Active or Archived. While the Course List is sorted by Course name, you can change it to sort by Subject or you can use the Grouping function to display the list by Subject.